Atlanta, June 13th 2017 – Ubimax, the leading supplier of Enterprise Wearable Computing solutions for the frontline worker, has been named AWE Auggie Award 2017 winner. This year’s AWE Auggie Awards ceremony celebrated companies and products deploying a full spectrum of AR & VR technologies designed to drive economic growth and shape the future of computing. Awarded in the category “Best Enterprise Solution”, the Enterprise Wearable Computing Suite dominated the final judging round at the 8th annual AWE in Santa Clara. The world’s first fully integrated Enterprise Wearable Computing Suite consists of the four core solutions “xPick” for intralogistics processes, “xMake” for manufacturing and quality assurance, “xInspect” for inspection and maintenance procedures as well as “xAssist” for remote assistance. Specifically developed to support the entire value chain of the frontline worker, companies deploying the solutions in live environments measure speed and quality improvements of up to 50%. Today, more than 150 global customers do rely on the Ubimax Enterprise Wearable Computing Suite with many of them in the process of scaling globally. AWE is the world’s largest and longest running conference and expo dedicated to augmented reality (AR) and virtual reality (VR). 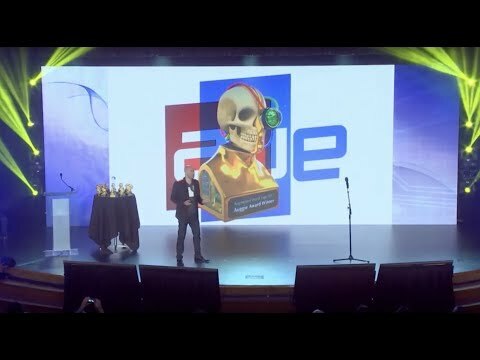 Since 2010, the annual AWE Auggie Awards have promoted and recognized the industry’s most exciting augmented reality AR & VR technologies, exposing new companies, talented individuals and innovative experiences to venture capitalists, industry experts, senior level business practitioners and AR & VR thought leaders. The 2017 AWE Auggie Awards contest was the most competitive in the event’s history, with more than 200 award submissions from a wide array of public and private companies of all sizes and industries, each vying to win an award across 10 different general categories and two best-in-show categories. “We are very excited having received the prestigious Auggie Award and I am happy that the team’s effort to transition from a European based company to a global company is paying off. Receiving the award for Best Enterprise Solution is a real testament not only to Ubimax but also to our numerous customers in the U.S. and Europe which have joined us on our journey of becoming the global market leader for Enterprise Wearable Computing Solutions for the frontline worker,” says Ubimax CEO Dr. Hendrik Witt.